Today, a mixture of nautical references and literary names that I hope you won’t deep six. This slang phrase meaning to discard something originates from the practice of burials at sea, which are done at a depth of six fathoms. The term was popularized during the Watergate trials of the early 1970s, when lots of documents were “deep sixed.” (Watergate, of course, also gave us the suffix “-gate” to denote scandals, taken from the name of the hotel where the scandal started). While we’re on the subject of nautical terms, Mark Twain, a.k.a. Samuel Clemens, took his pen name from such a term. 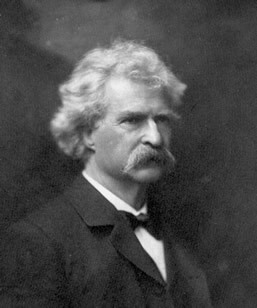 Clemens worked as a steamboat pilot on the Mississippi, where they would cry out “mark twain” to denote a river depth of two fathoms. Thus one of the most famous names in literature was born. While it is tempting to think that another literary giant, Charles Dickens, lends his name in a reverse fashion to phrases such as “hurt like the dickens” or “give someone the dickens,” the phrase has nothing to do with him. It was around hundreds of years before he was born, and is a euphemism for the devil.